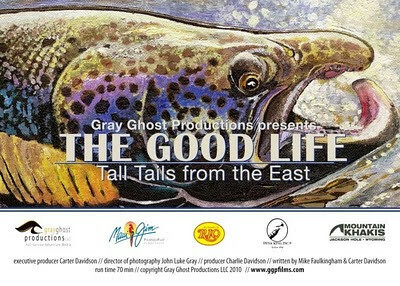 The Good Life - Tall Tails from the East is a film by Carter Davidson that documents a wide range of fly fishing experiences East of the Mississippi. It's an ambitious piece of work that strings together a big swath of geography, Labrador down to the Keys, and a generous amount in between. The Good Life flows back and forth from freshwater to salt. It links pros and unknowns together in an attempt to convey the "determination and enthusiasm" of fly fishing. Here's a the 4 minute trailer. I like what I've seen (and heard) from Gray Ghost Productions so far and I think you will too. You can catch this film at either of two Maine locations in April (Bangor 4/8 and Brunswick 4/15). These showings are being hosted by the dedicated team at Fly Fishing in Maine. Visit Fly Fishing in Maine for all location, date, time, and ticket details. Order a copy now.